Cells are the basic building blocks of life, but atoms are the basic building blocks of all matter, living and nonliving. The structural elements of an atom are protons (positively charged), neutrons (no charge), and electrons (negatively charged). Protons and neutrons are contained in the dense nucleus of the atom; the nucleus thus has a positive charge. Because opposites attract, electrons are attracted to this nucleus and move around it in the electron cloud. Electrons contain energy, and this energy is stored within the charge and movement of electrons and the bonds atoms make with one another. However, this energy is not always stable, depending on the number of electrons within an atom. Atoms are more stable when their electrons orbit in pairs. An atom with an odd number of electrons must have an unpaired electron. In most cases, these unpaired electrons are used to create chemical bonds. A chemical bond is the attractive force between atoms and contains potential energy. By bonding, electrons find pairs and chemicals become part of a molecule. Bond formation and bond breaking are chemical reactions that involve the movement of electrons between atoms. These chemical reactions occur continuously in the body. We previously reviewed how glucose breaks down into water and carbon dioxide as part of cellular respiration. The energy released by breaking those bonds is used to form molecules of adenosine triphosphate (ATP). Recall how during this process electrons are extracted from glucose in a stepwise manner and transferred to other molecules. Occasionally electrons “escape” and, instead of completing the cellular respiration cycle, are transferred to an oxygen molecule. Oxygen (a molecule with two atoms) with one unpaired electron is known as superoxide (Figure 8.2). 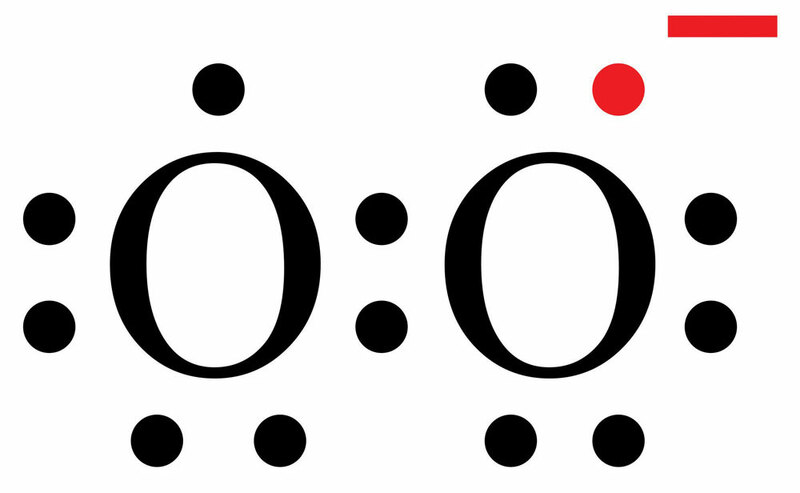 A molecule with one unpaired electron, which makes it a free radical. The reactivity of free radicals is what poses a threat to macromolecules such as DNA, RNA, proteins, and fatty acids. Free radicals can cause chain reactions that ultimately damage cells. For example, a superoxide molecule may react with a fatty acid and steal one of its electrons. The fatty acid then becomes a free radical that can react with another fatty acid nearby. As this chain reaction continues, the permeability and fluidity of cell membranes changes, proteins in cell membranes experience decreased activity, and receptor proteins undergo changes in structure that either alter or stop their function. If receptor proteins designed to react to insulin levels undergo a structural change it can negatively affect glucose uptake. Free radical reactions can continue unchecked unless stopped by a defense mechanism. Metabolism is defined as the sum of all chemical reactions required to support cellular function and hence the life of an organism. Metabolism is either categorized as catabolism, referring to all metabolic processes involved in molecule breakdown, or anabolism, which includes all metabolic processes involved in building bigger molecules. Generally, catabolic processes release energy and anabolic processes consume energy. The overall goals of metabolism are energy transfer and matter transport. Energy is transformed from food macronutrients into cellular energy, which is used to perform cellular work. Metabolism transforms the matter of macronutrients into substances a cell can use to grow and reproduce and also into waste products. For example, enzymes are proteins and their job is to catalyze chemical reactions. Catalyze means to speed-up a chemical reaction and reduce the energy required to complete the chemical reaction, without the catalyst being used up in the reaction. Without enzymes, chemical reactions would not happen at a fast enough rate and would use up too much energy for life to exist. A metabolic pathway is a series of enzyme catalyzed reactions that transform the starting material (known as a substrate) into intermediates, that are the substrates for subsequent enzymatic reactions in the pathway, until, finally, an end product is synthesized by the last enzymatic reaction in the pathway. Some metabolic pathways are complex and involve many enzymatic reactions, and others involve only a few chemical reactions. To ensure cellular efficiency, the metabolic pathways involved in catabolism and anabolism are regulated in concert by energy status, hormones, and substrate and end-product levels. The concerted regulation of metabolic pathways prevents cells from inefficiently building a molecule when it is already available. Just as it would be inefficient to build a wall at the same time as it is being broken down, it is not metabolically efficient for a cell to synthesize fatty acids and break them down at the same time. Catabolism of food molecules begins when food enters the mouth, as the enzyme salivary amylase initiates the breakdown of the starch in foods. The entire process of digestion converts the large polymers in food to monomers that can be absorbed. Starches are broken down to monosaccharides, lipids are broken down to fatty acids, and proteins are broken down to amino acids. These monomers are absorbed into the bloodstream either directly, as is the case with monosaccharides and amino acids, or repackaged in intestinal cells for transport by an indirect route through lymphatic vessels, as is the case with most fatty acids and other fat-soluble molecules. Once absorbed, water-soluble nutrients first travel to the liver which controls their passage into the blood that transports the nutrients to cells throughout the body. The fat-soluble nutrients gradually pass from the lymphatic vessels into blood flowing to body cells. Cells requiring energy or building blocks take up the nutrients from the blood and process them in either catabolic or anabolic pathways. The organ systems of the body require fuel and building blocks to perform the many functions of the body, such as digesting, absorbing, breathing, pumping blood, transporting nutrients in and wastes out, maintaining body temperature, and making new cells. Energy metabolism refers more specifically to the metabolic pathways that release or store energy. Some of these are catabolic pathways, like glycolysis (the splitting of glucose), β-oxidation (fatty-acid breakdown), and amino acid catabolism. Others are anabolic pathways, and include those involved in storing excess energy (such as glycogenesis), and synthesizing triglycerides (lipogenesis). Table 8.1 “Metabolic Pathways” summarizes some of the catabolic and anabolic pathways and their functions in energy metabolism. The breakdown of glucose begins with glycolysis, which is a ten-step metabolic pathway yielding two ATP per glucose molecule; glycolysis takes place in the cytosol and does not require oxygen. In addition to ATP, the end-products of glycolysis include two three-carbon molecules, called pyruvate. Pyruvate can either be shuttled to the citric acid cycle to make more ATP or follow an anabolic pathway. If a cell is in negative-energy balance, pyruvate is transported to the mitochondria where it first gets one of its carbons chopped off, yielding acetyl-CoA. The breakdown of fatty acids begins with the catabolic pathway, known as β-oxidation, which takes place in the mitochondria. In this catabolic pathway, four enzymatic steps sequentially remove two-carbon molecules from long chains of fatty acids, yielding acetyl-CoA molecules. In the case of amino acids, once the nitrogen is removed from the amino acid the remaining carbon skeleton can be enzymatically converted into acetyl-CoA or some other intermediate of the citric acid cycle. Acetyl-CoA, a two-carbon molecule common to glucose, lipid, and protein metabolism enters the second stage of energy metabolism, the citric acid cycle. In the citric acid cycle, acetyl-CoA is joined to a four-carbon molecule. In this multistep pathway, two carbons are lost as two molecules of carbon dioxide. The energy obtained from the breaking of chemical bonds in the citric acid cycle is transformed into two more ATP molecules (or equivalents thereof) and high energy electrons that are carried by the molecules, nicotinamide adenine dinucleotide (NADH) and flavin adenine dinucleotide (FADH2). NADH and FADH2 carry the electrons to the inner membrane in the mitochondria where the third stage of energy release takes place, in what is called the electron transport chain. In this metabolic pathway a sequential transfer of electrons between multiple proteins occurs and ATP is synthesized. The entire process of nutrient catabolism is chemically similar to burning, as carbon and hydrogen atoms are combusted (oxidized) producing carbon dioxide, water, and heat. However, the stepwise chemical reactions in nutrient catabolism pathways slow the oxidation of carbon atoms so that much of the energy is captured and not all transformed into heat and light. Complete nutrient catabolism is between 30 and 40 percent efficient, and some of the energy is therefore released as heat. Heat is a vital product of nutrient catabolism and is involved in maintaining body temperature. If cells were too efficient at trapping nutrient energy into ATP, humans would not last to the next meal, as they would die of hypothermia (excessively low body temperature). 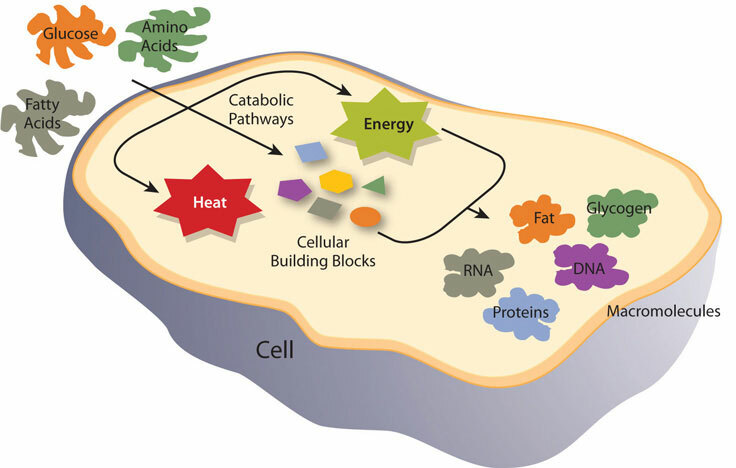 The energy released by catabolic pathways powers anabolic pathways in the building of macromolecules such as the proteins RNA and DNA, and even entire new cells and tissues. Anabolic pathways are required to build new tissue, such as muscle, after prolonged exercise or the remodeling of bone tissue, a process involving both catabolic and anabolic pathways. Anabolic pathways also build energy-storage molecules, such as glycogen and triglycerides. 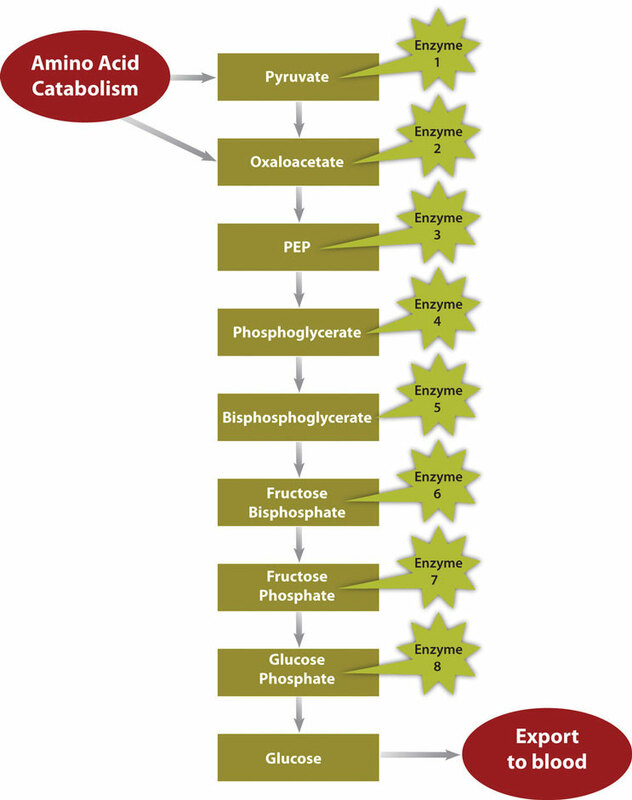 Intermediates in the catabolic pathways of energy metabolism are sometimes diverted from ATP production and used as building blocks instead. This happens when a cell is in positive-energy balance. For example, the citric-acid-cycle intermediate, α-ketoglutarate can be anabolically processed to the amino acids glutamate or glutamine if they are required. The human body is capable of synthesizing eleven of the twenty amino acids that make up proteins. The metabolic pathways of amino acid synthesis are all inhibited by the specific amino acid that is the end-product of a given pathway. Thus, if a cell has enough glutamine it turns off its synthesis. In a much less severe example, a person is also in negative-energy balance between meals. During this time, blood-glucose levels start to drop. In order to restore blood-glucose levels to their normal range, the anabolic pathway, called gluconeogenesis, is stimulated. Gluconeogenesis is the process of building glucose molecules mostly from certain amino acids and it occurs primarily in the liver (Figure 8.5 “Metabolic Pathway of Gluconeogenesis”). The liver exports the synthesized glucose into the blood for other tissues to use. In contrast, in the “fed” state (when energy levels are high), extra energy from nutrients will be stored. Glucose is stored mainly in muscle and liver tissues. In these tissues it is stored as glycogen, a highly branched macromolecule consisting of thousands of glucose molecules held together by chemical bonds. The glucose molecules are joined together by an anabolic pathway called glycogenesis. For each molecule of glucose stored, one molecule of ATP is used. Therefore, it costs energy to store energy. Glycogen levels do not take long to reach their physiological limit and when this happens excess glucose will be converted to fat. A cell in positive-energy balance detects a high concentration of ATP as well as acetyl-CoA produced by catabolic pathways. In response, the rate of catabolism is slowed or shut off and the synthesis of fatty acids, which occurs by an anabolic pathway called lipogenesis, is turned on. The newly made fatty acids are transported to fat-storing cells called adipocytes where they are stored as triglycerides. Fat is a better alternative to glycogen for energy storage as it is more compact (per unit of energy) and, unlike glycogen, the body does not store water along with fat. Water weighs a significant amount, and increased glycogen stores, which are accompanied by water, would dramatically increase body weight. When the body is in positive-energy balance, excess carbohydrates, lipids, and protein can all be metabolized to fat. The Atom by University of Hawai’i at Mānoa Food Science and Human Nutrition Program is licensed under a Creative Commons Attribution-NonCommercial-ShareAlike 4.0 International License, except where otherwise noted.